The new novel from the author of ART IN THE BLOOD. December 1889. Fresh from debunking a “ghostly” hound in Dartmoor, Sherlock Holmes has returned to London, only to find himself the target of a deadly vendetta. A beautiful client arrives with a tale of ghosts, kidnapping and dynamite on a whisky estate in Scotland, but brother Mycroft trumps all with an urgent assignment in the South of France. On the fabled Riviera, Holmes and Watson encounter treachery, explosions, rival French Detective Jean Vidocq… and a terrible discovery. This propels the duo northward to the snowy highlands. There, in a “haunted” castle and among the copper dinosaurs of a great whisky distillery, they and their young client face mortal danger, and Holmes realizes all three cases have blended into a single, deadly conundrum. When it comes to Sherlock Holmes pastiches, my thoughts often run contrary to others. I thoroughly enjoyed Michael Kurland’s books featuring Moriarty, Quinn Fawcett’s series featuring Mycroft Holmes, Anthony Horowitz’s “Moriarty”, and Sherry Thomas’ “Lady Sherlock “ series. Laurie R. King’s writing is good, and I read several, but just couldn’t go there. There are some lines you can’t cross with Holmes for me. See a trend? My preferred stories don’t feature Holmes and Watson other than perhaps peripherally. However, UNQUIET SPIRITS’ blurb was so intriguing I couldn’t help myself. I simply had to give it a go, and am extremely grateful my past disappointments didn’t deter me from this second book in Bonnie MacBird’s Sherlock Holmes Adventure series. 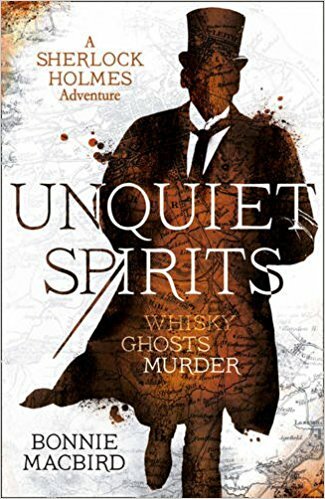 Darkly atmospheric and moody, with a healthy dose of the supernatural; UNQUIET SPIRITS was a pleasure from start to finish. Ms. MacBird has succeeded in capturing the spirit and feel of the originals. Not once was I pulled out of the story by a jarring incongruity and there was nary a flicker of disappointment. On the contrary, my mental movie had no difficulty envisioning Jeremy Brett and Edward Hardwicke in their appropriate roles from page 1. Tickled no end to have finally found a pastiche, featuring Holmes and Watson in their correct era, that I can actually read (without my inner voice yelling at me) and enjoy. Seriously y’all, I can’t recommend UNQUIET SPIRITS highly enough. I’ll be seeking out the first and on pins and needles for the third.